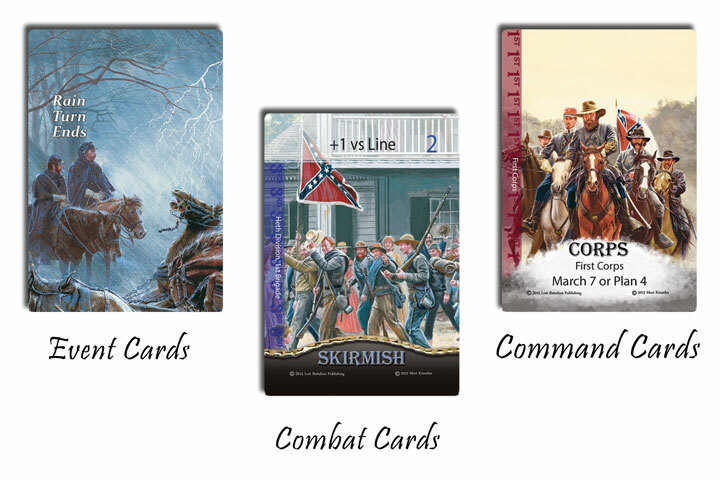 Rally Round the Flag® is a game pitting the Union and Confederate Armies against each other across the three days of the Battle of Gettysburg during the American Civil War. 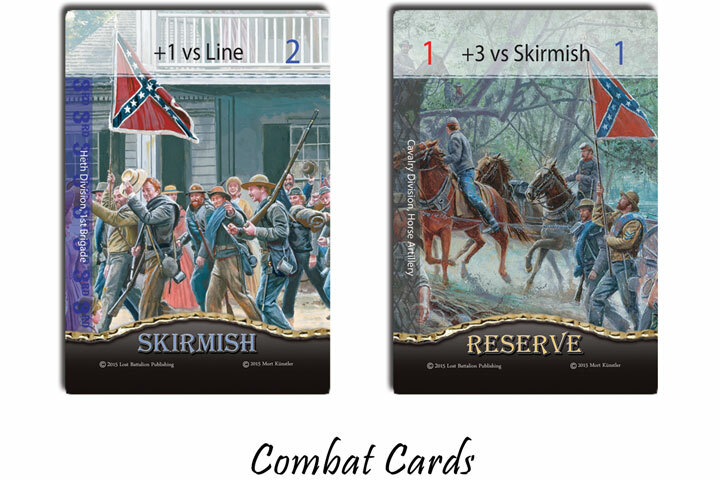 Take control of the Confederate Army and use their consolidated command structure to try and wrest control of Gettysburg from the Union. Or, take control of the Union Army and work to delay the Confederates long enough for reinforcements to arrive. At Gettysburg, both General Robert E. Lee and Major General George Meade were pulled into a battle they were trying to avoid. Lee arrived on the field at noon on the first day and took charge, directing the concentration of the Army of Northern Virginia. Facing Lee was Meade, a capable General Officer who Lee believed would defeat him, if Lee made any mistakes. In order to win, Lee either needed to pick a battlefield that would allow The Army of Northern Virginia to concentrate onto superior ground faster than the Army of the Potomac, or defeat the Federal army in detail before it concentrated its larger force on the field of battle. 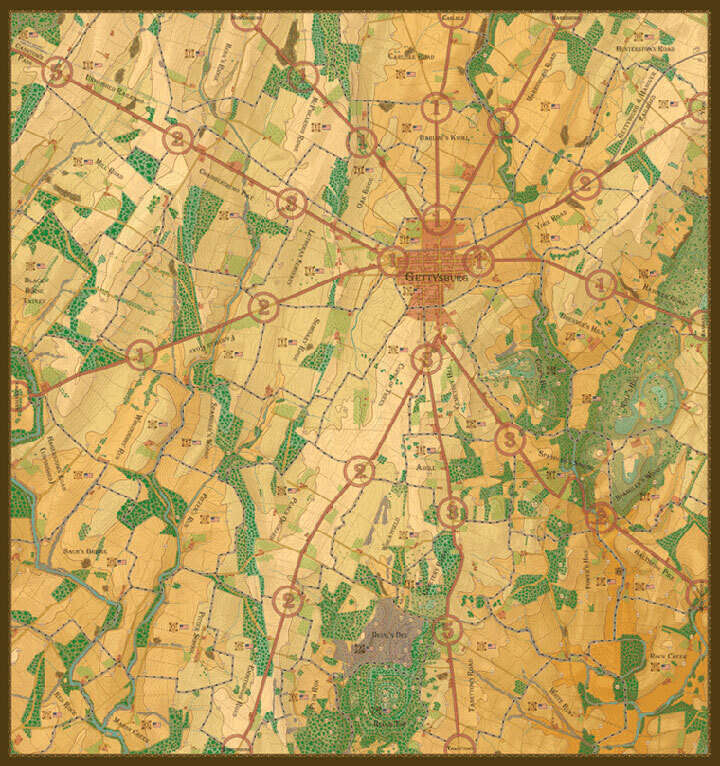 The map used in all Rally Round the Flag® Gettysburg games is derived from an 8 foot by 8.5 foot high resolution map, which has been hand painted over more than a year and then reduced to create the maps for the three various games of Rally Round the Flag. The map is a derivative of Army Corps of Engineers field maps created during the Civil War. From the highly detailed design, we achieved a seamless transition between the various scales of the games. This lets you speed through an epic battle and spend your gaming time on the parts of play that matter to you. Rally Round the Flag® uses the card system as a way to influence game play rather than to control it. The design uses Combat cards as a way to shift the odds of battle after action is joined. This means an apparently weak defender may have reserves or unexpected tactics that seize initiative or blunts a well-designed attack. Who is in command is critical in all levels of Rally Round the Flag®. The leadership, military skill, heroism and rank all effect play. 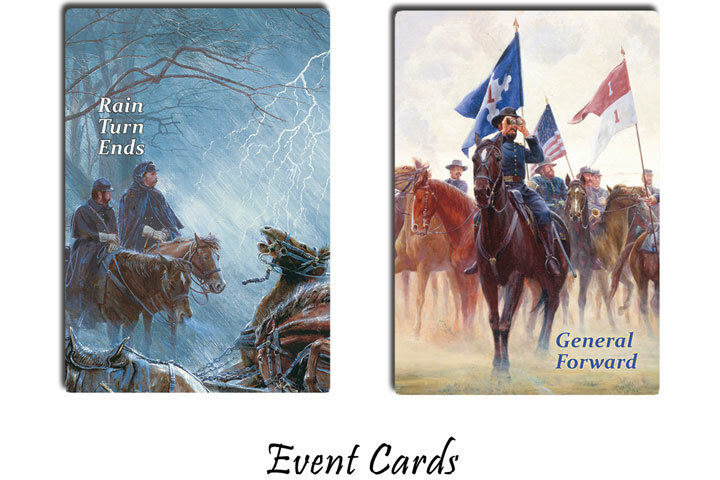 The Leadership of a General or Officer affects his influence on events – represented by the cards he draws and his ability to get troops to execute his plans when under fire. Both of these factors change the rapidity of an attack and its effectiveness. The Leader’s military skill affects his ability to move his forces and deploy them for combat, and his heroism inspires his troops to endure the fight and press the attack. 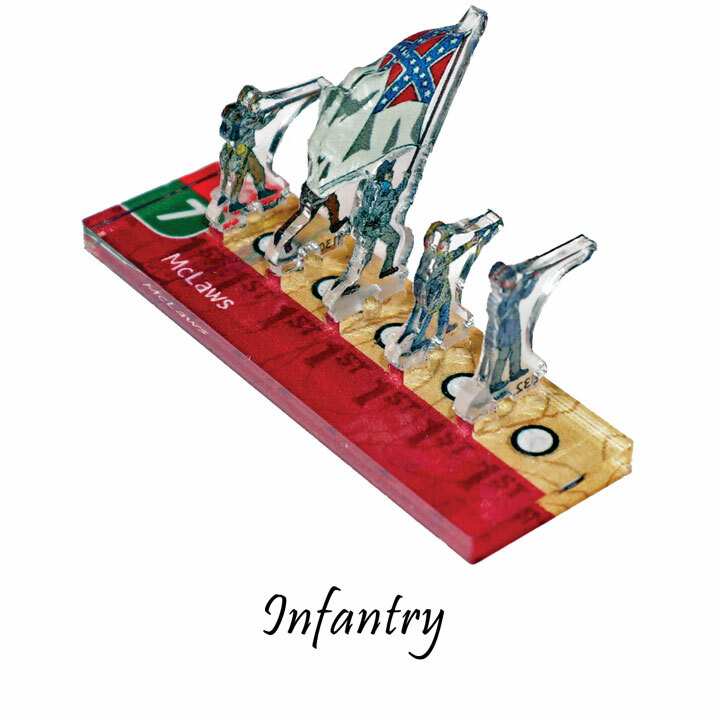 Rally Round the Flag® includes stands for all of the units that fought in the pivotal Battle of Gettysburg. 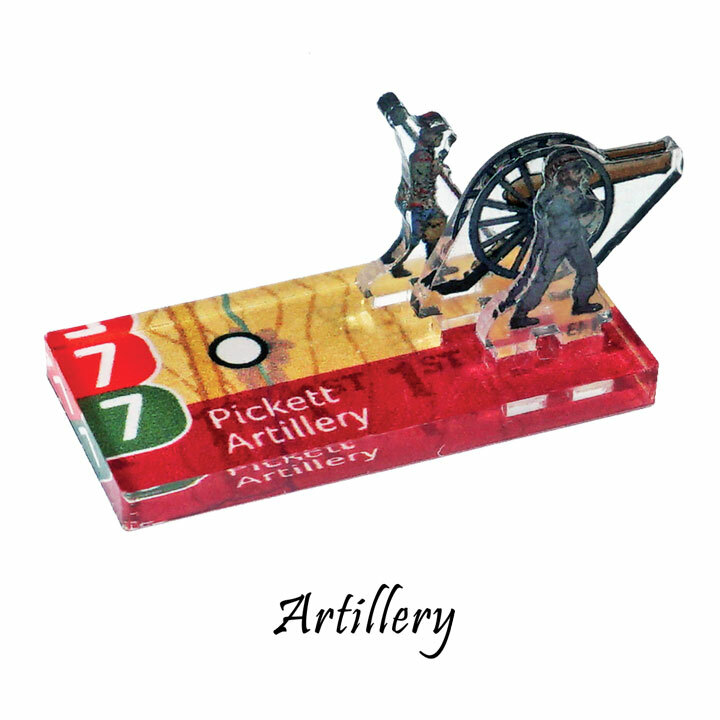 Infantry, Cavalry and Artillery units have Fire and Troop Quality values on the stand of troops. 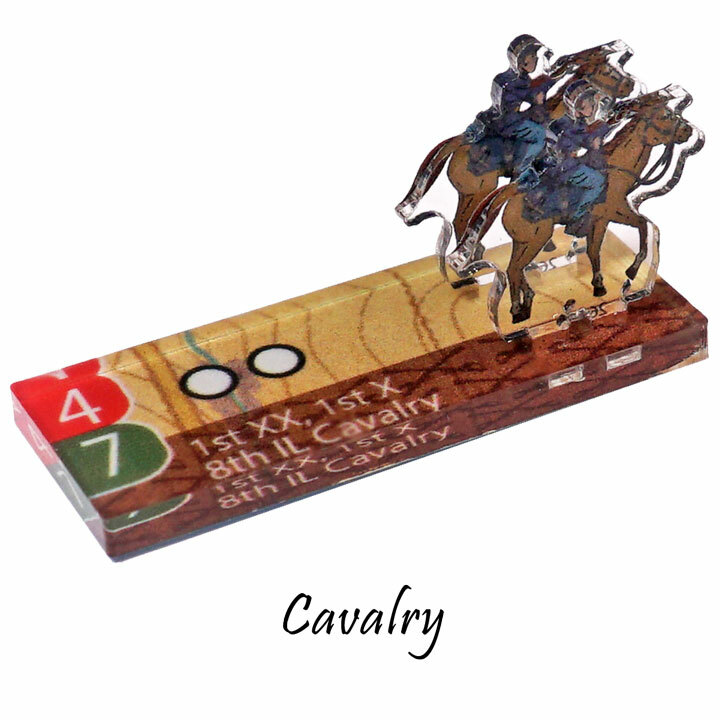 Also, the Cavalry has replacement stands for mounted and dismounted troops including the Horse Holders. Leaders have Command, Leadership and Heroism; all three values are printed on the leader’s base. The shape of the base indicates the level of command held by the Officer. 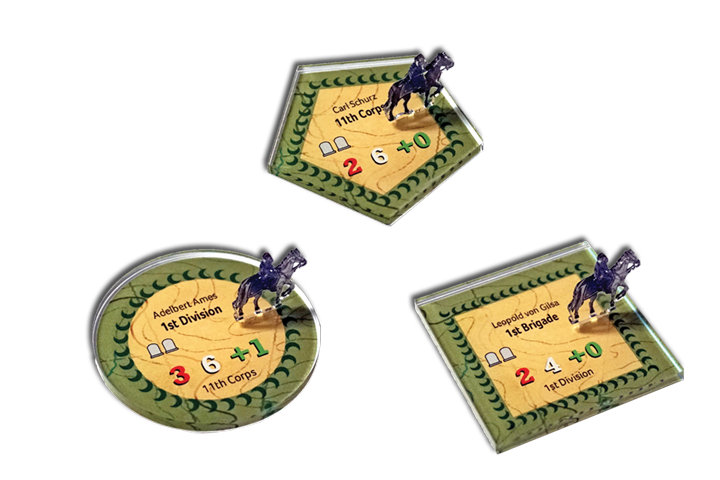 Squares are Brigade commanders and are used when playing the Brigade Command game. Circles are the Division commanders and are used with the Division Command and Brigade Command games. Pentagons for Corps along with the Heptagon for the Army commanders are used in all of the games. Rally Round the Flag® uses Area Movement on the Grand Tactical map, which is provided in the Brigade Command game, and “Movement Arrows” tied to the troop’s quality when playing on the Tactical Map during combat resolution. Brigade or Regiment movement, requires activation using a command point. Once activated a Brigade may move to a new area, or engage in combat in an area they occupy. Regiments can either use the Orange Movement arrows, or the Blue Tactics arrows to perform movements and realignments. In all cases, a Command Point is needed to move a unit in any manner. Combat in Rally Round the Flag allows players to pick the detail for each battle. If a battle is unimportant or a foregone conclusion the resolution of the combat can be completed in less than a minute for a small battle. 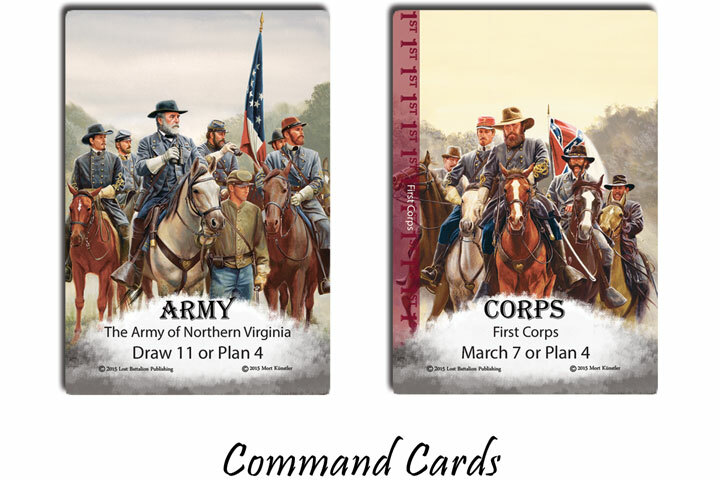 To win Rally Round the Flag® players vie for control of the critical areas of the Gettysburg battlefield road network - represented by the victory points printed on the Grand Tactical Map. In addition to scoring victory for critical areas of the battlefield that are held, players score victory for defeating enemy brigades. This is done by shattering a brigade during a battle or the brigade failing a troop’s quality check once they have reached a breaking point. The Grand Tactical Map is used for scoring in all three levels- for overall victory. Specific scenarios may have specific victory conditions for a smaller encounter.